Typhoon Soudelor swept across Taiwan on August 7 as one of the strongest recorded, with over 50 inches of rain in some locations and wind gusts well over 100 mph. Here in the capital city of Taipei, much of the damage was related to trees being blown over. Remarkably, many of the streets were cleaned up in the first 48 hours (although on the fifth floor of our building we have been without water for 3 days (!) despite repeated visits by low-level repairmen). The second tallest building in the world, “Taipei 101” easily handled the storm as it was designed to withstand winds of 130+ mph. On our recent visit, window washers were hanging outside the 89th floor of the building at the enclosed observation deck–yikes, what a job! Stabilization damper at the 88th floor of Taipei 101 that enables it to withstand earthquakes and typhoon winds. 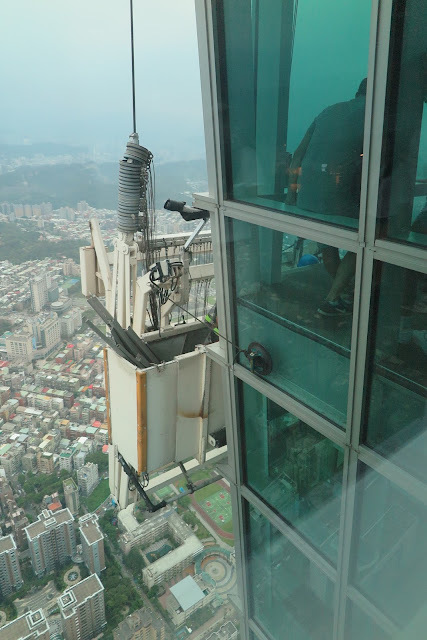 Suspended window washing staging, 89th floor of Taipei 101. There were two window washers in the basket, see top of blue helmet near the feet of an observer through the window. The modern capital city of Taipei has the patina of a well functioning metropolis, without the apparent chaos of many other Asian cities. Traffic seems to move, the subway is modern and clean, the sidewalks are navigable, and the pedestrian experience is not death defying. The only major impediment to getting around and experiencing what the city offers is the oppressive heat and humidity, similar to Washington DC but much worse (more like Mumbai in May). The subway, called the MRT, is air conditioned, and has neatly organized lines for entering and leaving the cars. As in Tokyo, the station entrances are numbered and there are maps at each station so you know where you are when you exit the station. I have seen almost no older people on the MRT–it is mostly young professionals and teens, heads bowed over the ubiquitous cell phones and tablets. I have seen only one book being read on the MRT in three days riding around the city. We have visited several of the top sites since arriving in Taipei. They include the Chiang Kai-Shek Memorial Hall – basically a memorial with a connected museum that displays photos, dioramas, and artist renderings explaining Chiang Kai-Shek’s life and role in the history of the 20th century. Our Taiwanese friend explained that the current special exhibit of paintings illustrating the Nationalists’ role in WWII is specifically to explain history to the huge numbers of Chinese tourists from the mainland who are flocking to Taiwan. The crowds of mainland Chinese at the National Palace Museum were amazing. If half of China is traveling overseas, half of them must have been at the Museum yesterday. Eighty percent of the museum’s collection consists of the contents of the imperial palace in the Forbidden City which the Nationalists emptied prior to their retreat to Taiwan in 1949. The collection of jade is outstanding; the most well loved and viewed is a 5″ jade cabbage with a grasshopper on top (laying thousands of eggs, the grasshopper on the cabbage represents fertility and abundance). The line to walk by the cabbage on display wound down two floors; needless to say, we stood at the exit and saw it from 20 feet and that worked for us. 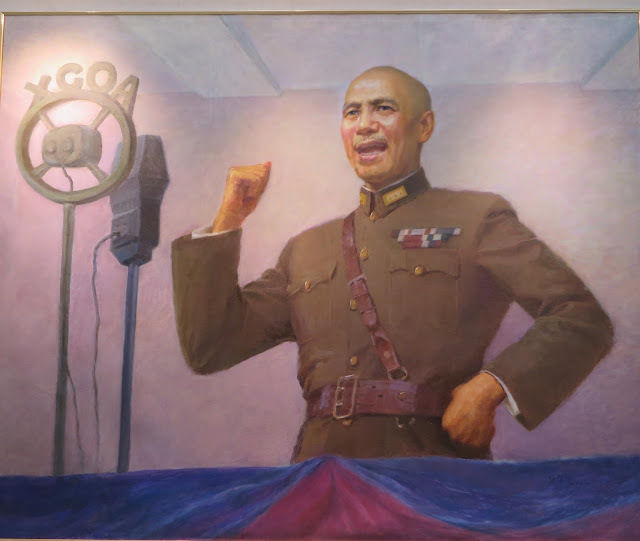 Painting of Chiang Kai-Shek portrayed during WWII. This special exhibit of paintings is meant to explain the role of the Nationalists in fighting the Japanese for the benefit of mainlander tourists. In the past, the Communist narrative discounted the importance of the Nationalists (and Chiang Kai-shek in particular) in defeating the Japanese. This narrative may be changing, and the Taiwanese are invested in that happening. Longshan Temple, Buddhist and Taoist, built in 1738 by settlers from Fujian Province. There have been migrations of mainlanders to Taiwan for centuries.